For background information about the witchcraft trials in Connecticut, download the Fairfield Museum’s “Accused: Fairfield’s Witchcraft Trials” Educator Guide prior to teaching the lesson. Were religious or social differences tolerated in the 1600s? Did everyone have equal protection under the law at the time? Why were women particularly targeted as witches? Could something like this happen today? Detail from Saducismus Triumphatus or, Full and Plain Evidence Concerning Witches and Apparitions… by Joseph Glanvil — Boston Public Library. This image comes from a popular book published in London in 1689. It claimed to record “true” supernatural events and probably influenced many colonial thinkers. 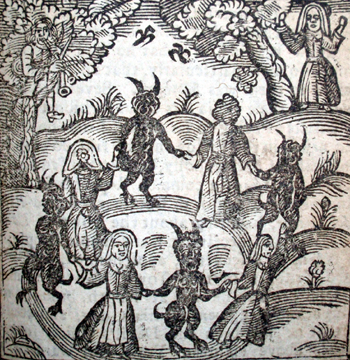 In this detail, women gather with the devil in a wooded area. Illustration from The Kingdom of Darkness by Nathaniel Crouch. London, 1728. World Imprints Collection, Connecticut Historical Society. 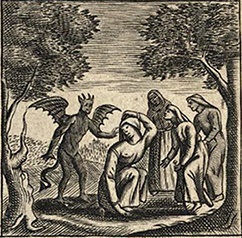 Although it was published more than 30 years after the last of the Connecticut witch trials, this image illustrates the enduring belief, shared by most New Englanders in the 1600s, that the devil could influence witches to use magic against others. Charges of Catherine Branch against Elizabeth Clawson (Elizabeth Clauson), Mercy Disbrough (Mercy Disbrow) and Goody Miller, 1692. Samuel Wyllys papers, Connecticut State Library. 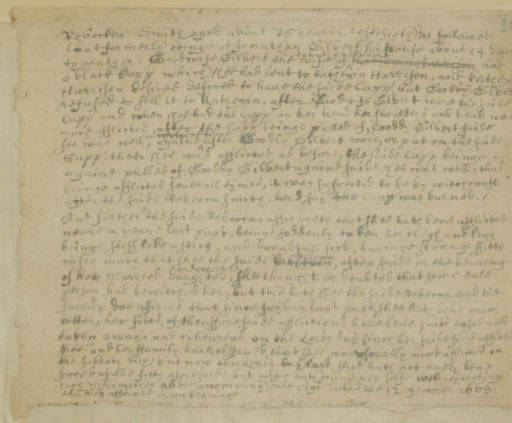 Case of Goodwife Seager (Elizabeth Seagar), Testimony Of Robert Sterne, around 1662-1665. Samuel Wyllys papers, Connecticut State Library. 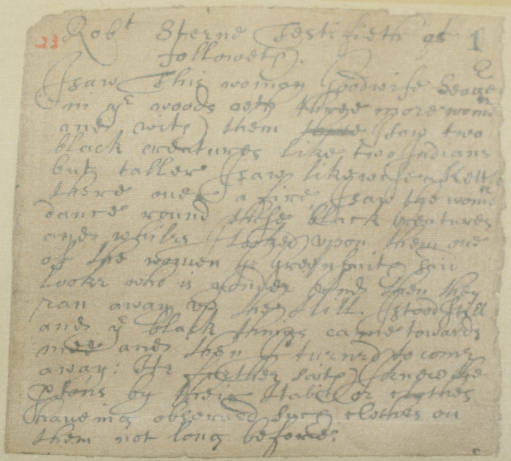 Case of Katherin Harrison (Katherine Harrison), Testimony of Rebecka Smith (Rebecca Smith), 1668. Samuel Wyllys papers, Connecticut State Library. Case of Katherin Harrison (Katherine Harrison), testimony of John Welles. Samuel Wyllys papers, Connecticut State Library. Because the language in the court documents can be difficult for students to read (little punctuation, inconsistent or archaic spelling, etc. ), a PDF with transcriptions is provided here. Begin the activity by having students examine one or both of the historic images as a class, in small groups, or individually. Describe what is going on in the image(s). What is the setting? Who are the figures? What are the activities? Break students into smaller groups, each with one of the court documents (including the transcription). What details can be gleaned from each document? Who is being accused? What can you learn about this person from the text? Who is doing the accusing? What can you learn about this person from the text? What are these people being accused of? What can you infer from the testimony about why this person has been accused? What beliefs or values held by the accused or the accuser are suggested by the testimonies? Have each group share their discoveries and note similarities and differences. Have students supplement their conclusions from the inquiry activity with information from additional resources (see below for some suggestions) to help them develop answers to the compelling and supporting questions posed at the beginning. Conclude with a discussion or writing activity based on the questions: Could something like this happen today? Does it? Witchcraft in Connecticut, 10/29/2014. A short background essay from the Connecticut State Library. Connecticut Witch Trials and Posthumous Pardons. A report from the Office of Legislative Research providing some historical and legal background and a list/timeline of those accused in Connecticut. Research Guide to Colonial Witchcraft Trials. This comprehensive bibliography contains the materials available from the Connecticut State Library. Matthew Grant kept a diary that had an entry about Alse Young’s execution at the Old State House in Hartford. 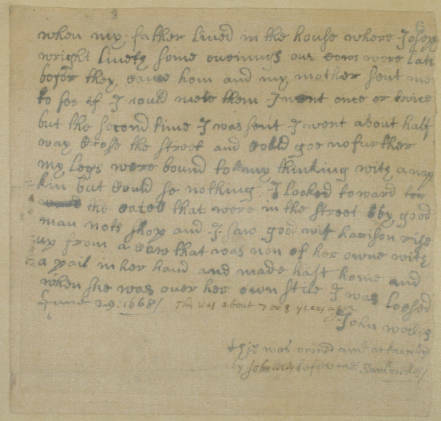 You may see both the scans of the original document and a transcription of the text in the digital collection of the Connecticut State Library. The Wonders of the Invisible World: Being an Account of the Tryals of Several Witches Lately Executed in New-England: and of Several Remarkable Curiosities Therein Occurring. Cotton Mather, 1693. For a further connection, investigate with students accusations of witchcraft in contemporary Africa and Asia. 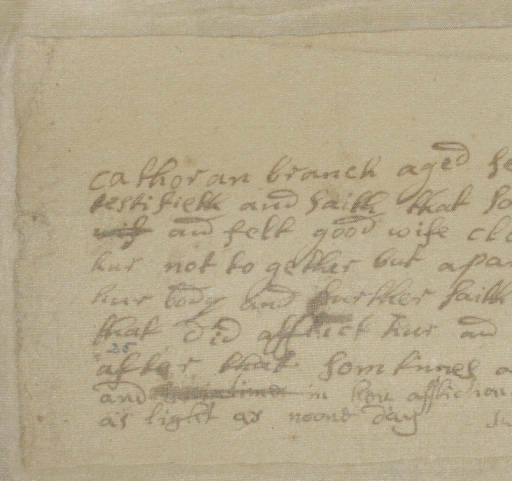 The Connecticut State Library has an extensive collection of documents and materials about the Connecticut witchcraft trials. The Town Green in Fairfield was the site of the “trial by water” of Elizabeth Clawson and Mercy Disbrough. Although the pond is no longer there, outdoor signage marks the spot and describes the 1692 trials. The Fairfield Museum and History Center offers educational programs about the witchcraft trials on the site and in the adjacent museum. Students with a particular interest in the Connecticut witchcraft trials can conduct additional research into one accused person or one town where people were accused in the 17th century. Visit the state library, contact a local historical society, or read more. Many of the online resources listed on this page will lead to other books and articles. Fairfield Museum & History Center: Download the “Accused: Fairfield’s Witchcraft Trials” Educator Guide, including excerpts from author and illustrator Jakob Crane’s graphic novel about the Connecticut witchcraft trials. ConnecticutHistory.org: “Witchcraft in Connecticut” by Andy Piascik.